...as you can tell by the paddle wheel. However, one, that's not the real name of the boat (I'm not sure it has one); two, the small paddle wheel is a fake; it is just dragged through the water rather than actually driving the boat; and, most importantly, there was no Dixieland band —a group of Sardinian folk singers would have been out of character. (I can't tell you how out of character! I would have thrown myself into the paddle-wheel.) The owners of this small pleasure craft, however, wanted to create a "Mississippi" experience in the least likely of places, an artificial lake in the middle of a Mediterranean island, Sardinia. Actually, the Sardinian landscape is deceptively like the southwestern US in many places and a lot of places are remote enough to give you a feeling—not at all an illusion—of isolation as you go along the 20 km length (12 miles) of Lake Flumendosa, the third largest of such lakes on Sardinia. As a matter of fact, only one lake —Barras— on the island is natural; the others are formed by taking advantage of the many rivers that flow down from both sides of the watershed in the Gennargentu massif, the peaks of which are at about 1800 meters. Lake Flumendosa is fed by the major river of that name as well as by secondary sources. The lake was created in the late 1950s by the damming of the Flumendosa near the Nuraghi archaeological site of Arrúbiu above the town of Escalaplano about one-quarter of the way up the island from Cagliari. The entire area is rich in these ancient Nuraghi ruins, many of which have yet to be excavated properly and probably a number of which have yet to be even found. The lake is quite deep for most of its length, approaching 100 meters near the dam. Along its length the lake is about 200-300 yards wide in most places, adding to the impression that one is paddle-wheeling along a river. Occasionally, there are side channels, which give a fjord-like look to the whole affair. At the dam, the overflow is channeled into a second lake below Flumendosa, Lake Mulárgia, also fed by other sources. That water, in turn, is channeled down towards the reservoir for the city of Cagliari at the southern tip of the island. Lake Flumendosa was not created as a resort. To my knowledge, I am in the only hotel on its banks —at least in this area. There is one other “port” at the town of Villanuvatolo. 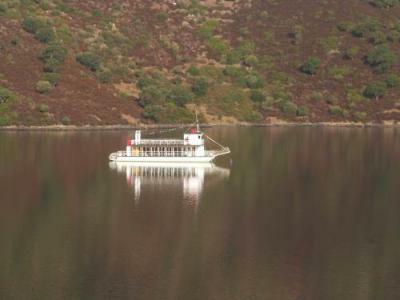 The lakes in Sardinia were created to manage water resources, including hydroelectricity. The “pleasure people”—who provide hotels and paddle-wheelers—claim it took them years to get permission for such things. The access road from the mountain road down to the lake is horrible and adds to the 19th-century flavor, unfortunately. Adding to the isolation is total lack of internet access! (How did Mark Twain survive?) But there is satellite TV with at least 6 Arabic language stations including All-Dubai Sports All the Time! I actually spent a half-hour mesmerized by a direct transmission from Mecca in Arabic with pilgrims somberly parading around the Kaaba. Kind of like watching St. Pete’s with extra headgear. I think I just said said something blasphemous. We are almost at the northern tip of a peninsula on the island of Maddalena—where it says “P. Abbatoggia” on the map. The land mass on the right—where it says “M. Arbticci” is actually another island, Caprera, the home of Garibaldi. There are a number of smaller islands to the north and east as you move into the infamous Boniface Straits—infamous because of the wind. Beyond that, not visible on this map is the French island of Corsica. “Hah!” says my wife. It’s really Italian and wound up in the hands of the French only through political skulduggery back in the 1700s. The weather has been (until today) clear enough to see Corsica quite clearly and I am guessing that it is not more than 20-30 miles away. If I had Google earth at my disposal, I’d check (1 degree of latitude equals 60 nautical miles, I think). Anyway, it looked like this at dawn yesterday (photo, below). The zoom on the camera makes Corsica appear closer than it is to the naked eye. The building is a lighthouse on a nearby island, then Corsica looming in the background. 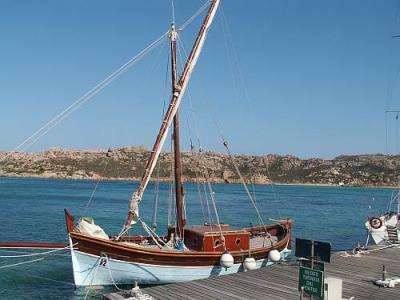 Below is a photo of one of the two boats that this chapter of the Italian Touring Club owns. (That is where we are staying, at a “village” of the touring club. All you do is eat. Oh, you also hurt yourself in the sea. I did that—cut my leg on a rock. The sea is full of what they call in Italian “mucilagine”, obviously related to the English word “mucilage," a word I recall from bottles of glue. Here it means slimy sea vegetation. They tell me it comes from Japan. Yucky stuff—which I have nicknamed “Neptune Snot”. Here’s the boat. The rigging is called a “Latin sail.” I don’t know why, since it’s an Arab invention. We went back to Sardinia for four days, to a place I had never been and not really heard of—the island of St. Antioco. 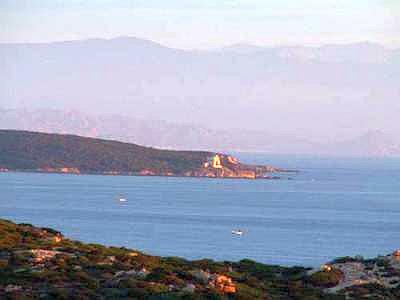 (The lower and larger of the two small islands off the southwest tip of Sardinia—photo, right). It turns out that it is the fourth largest Italian island (after Sicily, Sardinia, and Elba). I would have guessed the first two (although not necessarily in the correct order—they are almost the same size), since both of them are huge enough to have been independent states at various periods, but I didn’t/don’t know the smaller islands very well. St. Antioco is more than twice the size of Ischia. Anyway, the island has been connected to the mainland by causeway and bridge since the time of the Carthaginians, so I don’t know how much of an island it really is. Anyway, the whole southwestern part of the island is a good place to get a handle on Mediterranean history and chronology: Late Neolithic (the Ozieri culture) to the later Nuraghi culture to the Phoenicians, Carthaginians, Greek, Roman and even the fascinating independent period of the Sardinian “judges” (a confederation of sorts that lasted from 900-1400 a.d. before they got munched up by the new upstart Med nation states). (The Italian term is Guidicato, usually left untranslated in English because there is no good term unless you invent “judgeocracy.” Wait, what is the Greek for judge? Krino-? I just found some uses of krinocracy, but I still don’t understand what it means. It may be the term used by those who think we are letting judges interpret the constitution too much.) Remnants of all of that are often within a few minutes drive of one another. We went to the nearby town of Iglesias on the mainland, at one time a center of silver and lead mining. Now it’s fallen on hard times. It’s weird scenery—dozens of abandoned mine shacks, huge ones, all over the hillsides. There is some optimistic talk about turning some of them into hotels for tourists, but that will never happen. The place is inland and too warm in the tourist season. 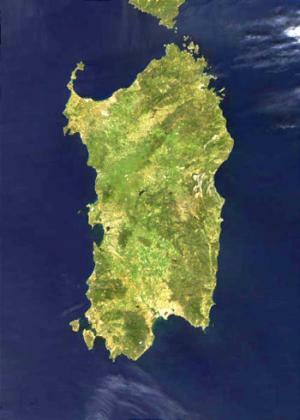 We are right on the southeast corner of Sardinian outside of a town called Villasimìus, pop. normally around 3,000 but swollen to 50,000 at the height of the tourist season (just past). That tip of the island is actually south of the city of Cagliari, which is at the center of its own large gulf, so you swing down the gulf to the SE when you leave Cagliari in order to get to where we are. It is a very scenic coast, reminiscent of the Amalfi drive, including all of the don’t-you-dare-take-your-eyes-off-the-road hairpin turns. I went to the local small (but fine) archaeological museum today, where it occurred to me that I never really had straight what is meant by the term “Phoenecian-Punic.” “Phoenician” refers to the Phoenicians. (I’m a quick study!) and “Punic” refers to the Carthaginians. Carthage was originally a Phoenecian city, so I was a bit confused by displays that tell you that “the Phoenecian settlement of Cuccureddus was destroyed by Carthage.” Apparently, that is simply a matter of an off-spring culture becoming stronger than the parent and eventually waging war against it —something Oedipal, perhaps, raised (lowered?) to the level of geopolitics. In any event, the Phoenecian-Punic period is generally listed as 750-238 BC, the former date marking the first wave of Phoenician expansion from the Middle East to the western Mediterranean, and the latter date being when the island of Sardinia was itself incorporated into the not-yet Roman Empire as a result of the First Punic War. 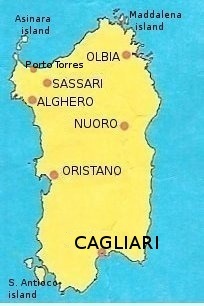 The presumed date of Carthiginian incursions on its own parent Phoenecian settlements in this part of Sardinia is about the middle of the 500s BC. The Phoenicians came to this part of the Mediterranean to trade, no doubt, with the Etruscans and pre-Roman Italic tribes on the mainland and with areas to the West, such as the Balearic islands. 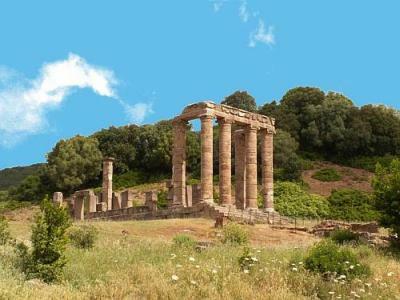 There is, however, evidence of much earlier habitation in this part of Sardinia and, indeed, all over the island, including the Nuraghic culture or cultures (1600-500 BC) that were responsible for the stone dwellings and megaliths that are iconic of the island; the remains of about 7,000 nuraghi have been found on the island, some of them quite substantial. Before that, there was the Neolithic period (or Recent Stone Age) (6000-2700 BC) of which there remain parts of various settlements, including a nearby Domus de Janus (house of spirits), a large rock hollowed out to form a funeral chamber within, leaving the natural rock surface to serve as the outer wall. There are about 2,500 of these things found throughout Sardinia; they provided the most common form of Neolithic burial. Some have a single chamber, but they can have as many as 20, in which case they are a form of catacomb, I suppose. The term Domus de Janus looks Latin but is Sardinian. Without my handy OED, I am guessing that that Domus is pre-Latin Indo-European. Domus de Janus is also the name of the hotel we are staying at tonight and tomorrow. Very funny. Archaeology in much of this area started as recently as the 1970s and 80s when a lot of sites were irreparably damaged by the bull-dozers of development. The hill in back of our hotel in Villasimìus is apparently the site of one such Phoenician settlement, but you’d never know it. These neo-Phoenicians (I think a lot of them are from Germany) do have a nice small golf course, though. It’s amazing how much information is gained from pottery inscriptions and design. The many amphora from archaeological sites plus the many more dredged up by underwater archaeologists in the nearby waters are like books that used to have food and wine in them. (An unbeatable combination!) It’s quite a task—and much remains to be done around here—to put together all the pieces, sunken and shifted over the centuries, of various cultures, from the Stone Age through the early Phoenician travelers, then the Greeks and Romans, the Byzantines and on and up to the Spanish ship that sank in the 1400s off the small Isola dei Cavoli off of Cape Carbonara just a few miles away from here. At that time, Sardinia—or a large section of it—was part of the so-called Crown of Aragon, a loose (pre-nation state of Spain) confederation of commercial sea-farers (much like the Phoenicians), a confederation that included Sicily and then the Aragonese Kingdom of Naples for a brief time. Sept. 23, 2009—Note to myself: see if I can find some research in population genetics and how it relates to the origins of the Etruscans. I bought a little journal off a newsstand, Sardegna antica, culture mediterranee, n. 35. (It’s hard to tell if that number 35 means the 35th in a series of general Mediterranean Culture or 35th in a series about Ancient Sardinia; I think the former rather than the latter.) In any event, there was an article entitled “Genetics” that claims older speculation that proto-Sardinians are related to Etruscans in now genetically shown to be wrong. (It also mentions the linguistic evidence that has long shown Etruscan not to be Indo-European.) There are a few interesting items in the bibliography, among others A Genetic History of Italy, though it’s from 1988—quite a while ago. There are some more recent citations as well. Update on Etruscan origins: In 2007, Professor Alberto Piazza, from the University of Torino reported to the European Society of Human Genetics that there is overwhelming evidence that the Etruscans were settlers from old Anatolia (now in southern Turkey). That conclusion was based on comparative DNA studies. "We think that our research provides convincing proof that Herodotus was right", said Professor Piazza, "and that the Etruscans did indeed arrive from ancient Lydia."